Mason Dragos competes on the Butler tennis courts. Dragos and the men’s tennis team improved to 9-4 with two wins on Feb. 23. Jimmy Lafakis/Collegian file photo. 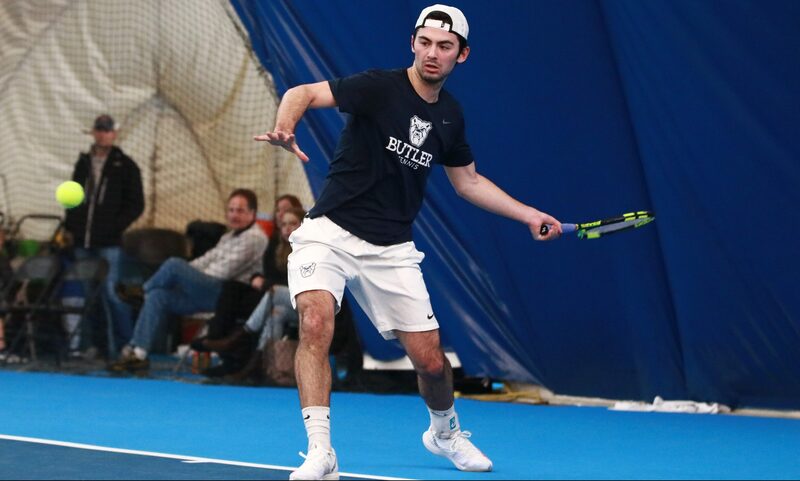 The Butler men’s tennis team took the trip to Rockford, Illinois, for a pair of matches against the Northern Illinois Huskies and the Green Bay Phoenix on Feb. 23. The Bulldogs picked up victories in both matches to improve to 9-4 on the season. The first was a tight match with NIU which required a major team effort. The Huskies started strong by taking the doubles point and winning the first two singles matches in the No. 2 and No. 4 spots. Experience helped the Bulldogs bounce back, however, as the seniors would give Butler four singles wins. Aviv Ben Shabat grabbed the first victory for the Bulldogs with 6-4 and 6-3 sets. Mason Dragos battled in the No. 1 spot and rebounded from losing the first set 4-6. He won the next two with 6-1 and 7-5 set victories over Eric Marbach. Spencer Lang tied the score at 3 with a win over his opponent with 6-4 and 6-2 sets. The deciding win came from Adrian Mag, who took the final two sets in his matchup 6-3, sealing the 4-3 win for Butler over NIU. The second match against Green Bay was not quite as intense, as the Bulldogs defeated the Phoenix 4-1. The Bulldogs won the doubles point thanks to a 7-6 third set win by Thomas Brennan and Lang. In singles, Butler took straight set victories by Brennan, Ben Shabat, and Ryan Roegner. The Bulldogs’ next match will be played at the Butler Bubble on March 1 at 1 p.m. against Cardinal Stritch.